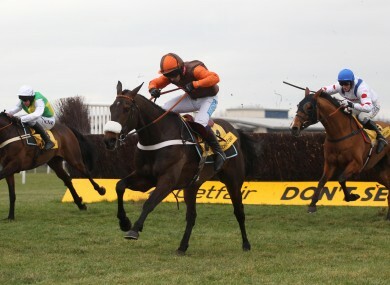 Long Run ridden by Sam Waley Cohen clears the last fence to win the The Betfair Denamn Steeple Chase. LONG RUN WAS pushed all the way by stable mate Burton Port at Newbury today. But the 4-7 favourite, ridden by Sam Waley-Cohen, edged it to get back to winning ways. “That was just what we wanted,” Waley-Cohen told Channel 4 afterwards, ”I was really pleased with his jumping. “He was a little careless with the water (jump), but apart from that he’s jumped really well. You couldn’t ask for more from a seasoned chaser. That is exactly the confidence boost you want to go to the Gold Cup with. We took the earplugs out but I’m not sure that made a big difference. “In a funny way, he felt like a different horse altogether today. In the paddock he was more alert and looking more up for it and he’s just gone out there and done it really well. Email “Long Run back to winning ways... but only just”. Feedback on “Long Run back to winning ways... but only just”.